Teach the Windows 10 content YOU want in LESS TIME! This book provides a solid introduction to Windows 10. The primary goal of the GO! Series, aside from teaching computer applications, is ease of implementation, with an approach that is based on clearly defined projects for students and a one-of-a-kind supplements package. The GO! series is the right solution for you and your students in today’s fast-moving, mobile environment. GO! focuses on today’s mobile worker wherever, whenever, and from whatever device. It covers Office Online, Office 365 collaboration, and touch devices, so students are prepared to work in any environment. Windows 10 is a new approach to operating systems for the more mobile world we live in. With Windows 10, apps, services, and content move across devices seamlessly, and updates will be delivered regularly. There are a variety of enhancements from Windows 10, and there are significant changes from Windows 7. 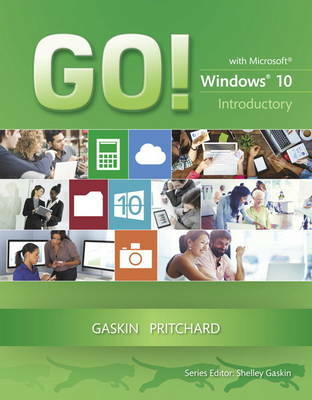 To guide both new and experienced users of earlier versions, the GO! series takes project-based approach, which allows students to explore the core functionality of Windows 10, while learning how to use it effectively. MyITLab is an online homework, tutorial, and assessment program designed for Information Technology (IT) courses, to engage students and improve results. HTML5 Simulation exercises and Live-in-Application Grader projects come with the convenience of auto-grading and instant feedback, helping students learn more quickly and effectively. MyITLab builds the critical skills needed for college and career success. Digital badges lets students showcase their Microsoft Office or Computer Concepts competencies, keeping them motivated and focused on their future careers.